Don and I retired to Charleston, SC after 30 years as a military family. We bought our first kayaks about 13 years ago while still living in the Washington, DC area. Kayaking instantly became our favorite way of exercising and shedding the stresses of hectic work weeks. It's really hard to pick a single favorite place to kayak! Every body of water has something wonderful to offer. We love the challenges of the ocean and open water paddling, but paddling the twisting black rivers around Charleston and slipping through the clear spring fed waters in Florida exposes us to scenic beauty and wildlife encounters that offer an other kind of thrill. 4) What’s the most interesting thing that ever happened to you on a paddling trip? One of my very favorite experiences while paddling was during a kayak rolling class at Tybee, GA. I was upside down (for the millionth time) in my kayak and a pod of dolphins feeding nearby started talking to each other...echo-locating? I was so excited I almost drowned. They must have been wondering why I couldn't keep my kayak up right! 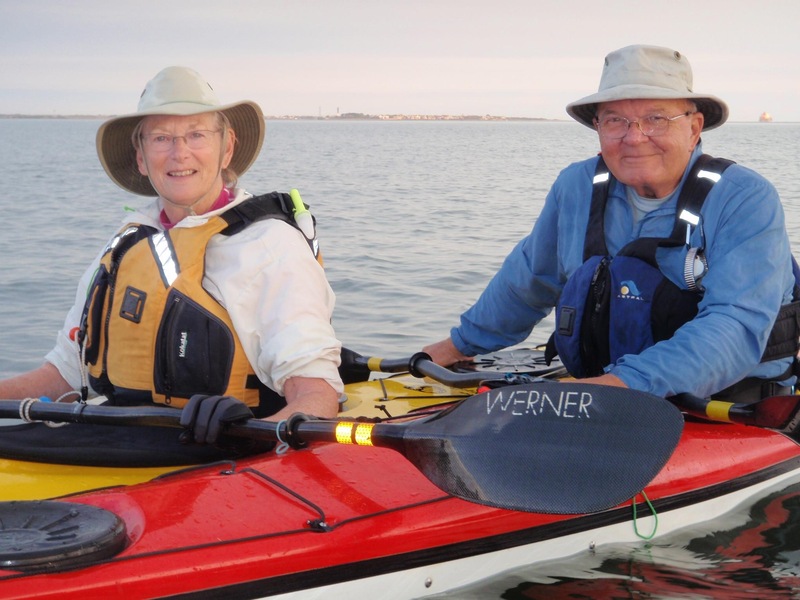 The Florida Keys Challenge 2015 is the third Paddle Florida adventure Don and I have taken part in. Our first Paddle Florida trip was the inaugural Keys Challenge five years ago. We paddled the Wekiva/ St. Johns River Ramble in 2013. 6) What keeps you coming back? We keep coming back because we always have a wonderful time on Paddle Florida paddles. The meals are delicious, the other paddlers are welcoming, and the Florida water ways cannot be beat for their beauty. And to top it all off, Bill and Jan make it all so easy! 7) What advice do you have for folks considering a Paddle Florida trip? My advice to those who haven't taken part in a Paddle Florida adventure is to jump in, sign up, and enjoy!